MEW. A much celebrated and loved experimental rock outfit with a career spanning more than 20 years, across six acclaimed studio albums, with fans the world over – and yet, they have only graced Australia’s shores ONCE! Luckily, Bird’s Robe (who brought them Down Under for their tremendously successful maiden voyage in 2015) are bringing them again to showcase their extensive back catalog and their new album Visuals. Presented by The Music, Bird’s Robe & Australian Mew fan community Mewstralia, the tour will take place in September 2017. Tickets go on sale this Friday 30th June at Oztix and birdsrobe.com. 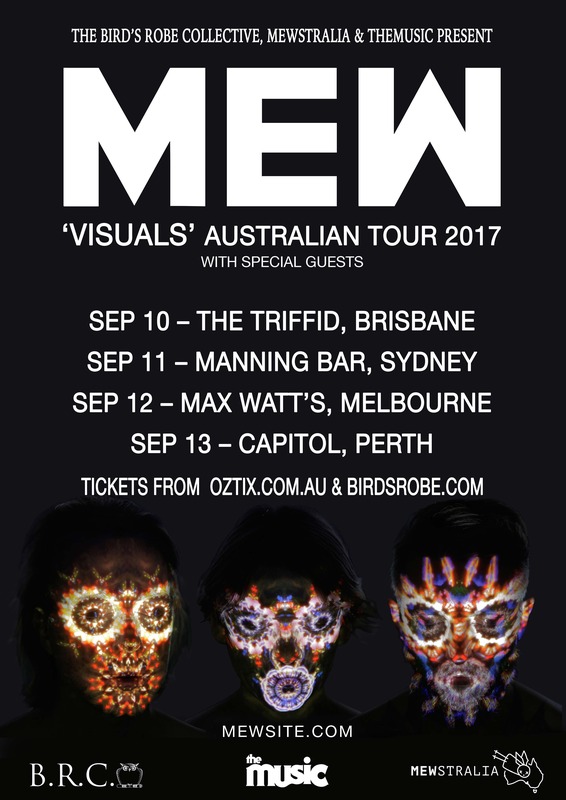 They are once again hitting Brisbane (September 10 at The Triffid), Sydney (September 11 at Manning Bar) …and Melbourne (September 12 at Max Watts), but for the first time ever, MEW will be venturing to Perth (September 13 at Capitol). Recorded and self-produced in Copenhagen, MEW’s latest album and the reason for this new tour, Visuals was completed in under a year and sees Mew at their most concise, each song representing its own little chapter and narrative. Twenty years into their career, Visuals is the distinctive sound of Mew seizing the moment. Mew formed as a quartet in late 1994 and following their debut ‘A Triumph for Man’ in 1997, they quickly established cult status. Their commercial break-through came in 2003 with the release of “Frengers” – showcasing their unique and quirky approach to crafting classic pop melodies. The record saw them tour with R.E.M. before continuing with 2005’s ‘And The Glass Handed Kites’. Their 2009 opus ‘No More Stories Are Told Today, I’m Sorry They Washed Away // No More Stories, The World is Grey, I’m Tired, Let’s Wash Away’ continued their ever expansive musical backdrop. Their record “+-“ saw them reach the heights of indie-rock stardom, headlining London’s Roundhouse and performing at festivals like Roskilde, Pukkelpop and Summer Sonic and one of the band’s biggest fans, Kiwi songstress KIMBRA, brought further buzz to the band when she featured on tracks ‘The Night Believer’ and ’Water Slides.’. Presented by Birds Robe and The Music, MEW’s Visuals Tour will hit shores in September.